The Introductory Physics 1D Motion Lab asks students to develop a computer model for a ball moving vertically under the influence of gravity. When the file is opened, it is initially programmed with a mass moving at constant velocity. It is assumed that students have first collected data of a basketball or volleyball bouncing under a motion detector. The lab instructions fully explain how to build the computer model using Easy Java Simulations modeling tool. The students will learn how to modify the model to simulate a bouncing ball, define variables, calculate relationships, and change the properties for plotting the graph. The calculus is done for the student. Editor's Note: The Easy Java Simulation tool greatly reduces the amount of programming required to develop computer models. Exercises in student-generated modeling are becoming much more widespread in physics education because of the opportunities for students to test and apply their own prototypes to explain and predict physical phenomena. This resource is distributed as a ready-to-run (compiled) Java archive. In order to modify the simulation (and see how it is designed), users must install the Easy Java Simulations Modeling and Authoring Tool. 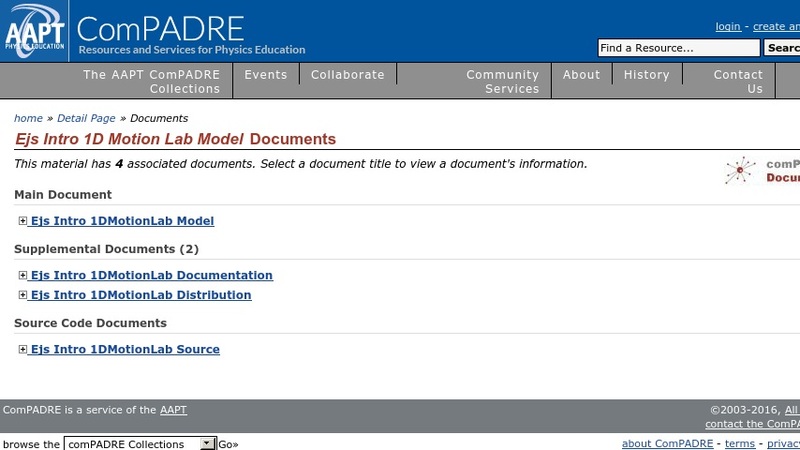 SEE RELATED MATERIALS for a link to install the EJS modeling tool.